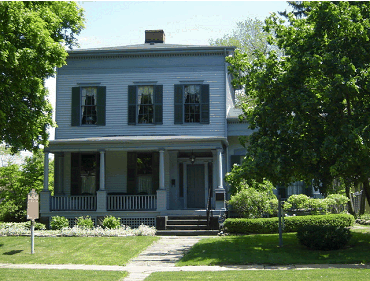 The Upton House, built by General Simon Perkins is the third oldest surviving house on Mahoning Avenue in Warren, Ohio. Tax records indicate the house was completed in 1840 in the popular Egyptian Revival style. 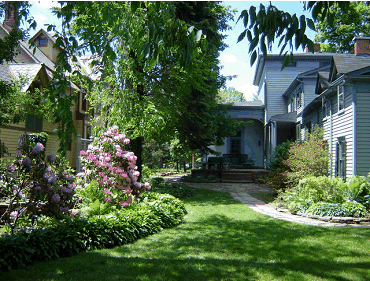 His son, Henry Perkins, sold the house to Ezra B. Taylor 32 years later, and the Taylor family took possession in 1873. 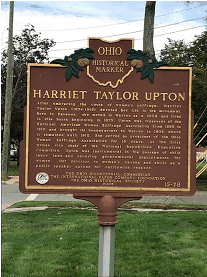 In 1887, Congressman Taylor deeded the house to Harriet "for love and affection." It remained her home for nearly 60 years, until 1931 when, at the age of 76, she lost it in a sheriff's sale. 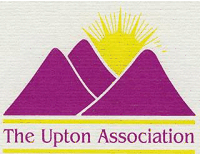 The Upton House became the temporary center of the National American Woman Suffrage Association in 1903, when the organization moved to Warren, Ohio by Mrs. Upton's request. 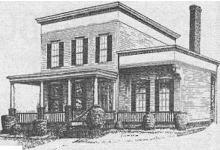 In 1905 the headquarters relocated in the west wing of the new Trumbull County Courthouse and remained there until late 1909 when it was moved to New York City. Under Harriet's direction, and with the help of Elizabeth Hauser of Girard, Ohio the NWSA grew from a crusade to a strong, well integrated organization under which victory was achieved in 1920. Many celebrities visited the Upton House during this period. 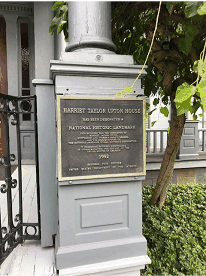 In 1989, a local effort was begun to save the Upton House from possible demolition because of its prominence with the national suffrage movement. 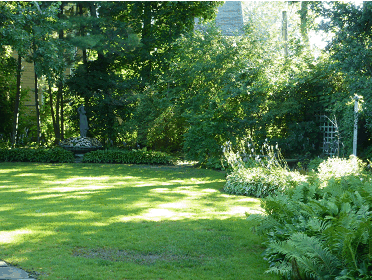 After extensive restoration, the Upton House achieved National Historic Landmark status in 1993. The restoration of the house and gardens continues today.